Looks like there might be a good reason that LHP Bill Bray has been less-than-awesome so far this season, and it’s not that lingering curse from having been part of The Trade. The Reds have just put Bray on the 15-day DL retroactive to last Thursday with a left groin strain that’s been bugging him since spring training. 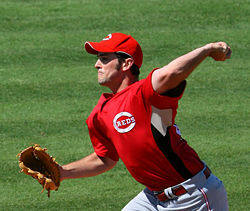 To take his place, the team has called up J.J. Hoover from AAA Louisville. With the Bats, young Hoover is throwing up a 2.00 ERA and 17 Ks over 9 IP. It’ll be Hoover’s first appearance in the majors, whenever Dusty Baker gets around to using him. If it takes as long for Hoover to get into a game as it took Frazier when he finally came up, we’ll see Hoover sometime this weekend. Posted in Bill Bray, Cincinnati Reds.